PG&E’s Commercial HVAC Optimization Program provides generous incentive payments to commercial customers who enroll in a single-year (Silver Tier) or three-year (Gold Tier) agreement for scheduled maintenance based on ACCA (Air Conditioning Contractors of America) Standard 180 and receiving services from an authorized HVAC contractor. To participate in the program you must enroll through an authorized contractor like Select Mechanical….you can opt out at any time. Customers who enroll in this program will receive incentive payments of up to $3,836 per unit. Additionally, customers enrolling in this program can save between $260 and $500/year/unit in operating, servicing and repair costs. 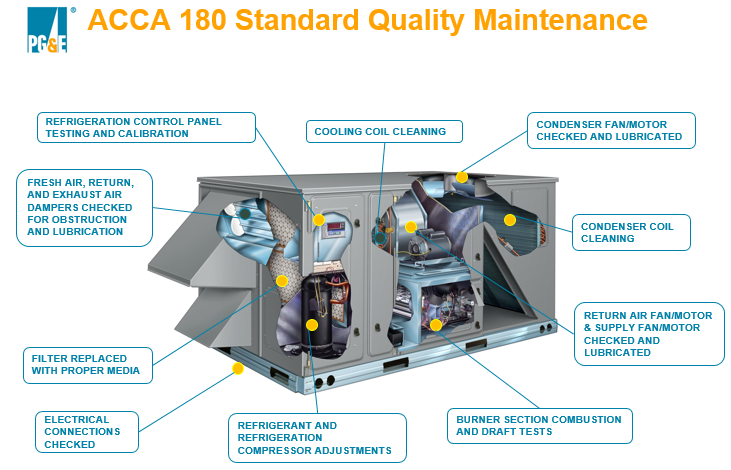 ACCA 180 requires a minimum of 4 quarterly inspections per year with various frequencies of tasks that meet or exceed manufacturer’s specifications for maintenance. Why did PG&E introduce this program? Following deregulation of the electric utilities in 1998, the California Energy Commission was placed in charge of a new Renewable Energy Program to help increase electricity production and reduce the carbon footprint of commercial buildings statewide. The PUC (Public Utilities Commission) directed PG&E and other Utilities to create programs that provide incentives for energy efficiency. Every PG&E customer pays into a fund every month called the “Electric Public Purpose Program” (it’s on page 4 of your PG&E bill). For example, Select Mechanical pays, on average, $90 per month into this fund. The only way to recover the money paid into the fund is by enrolling in the PG&E HVAC Optimization Program with an authorized contractor like Select Mechanical. It sounds too good to be true, is it? The incentive money for enrollees in the PG&E HVAC Optimization Program is there for the taking by commercial customers who enroll their qualified HVAC units through an authorized contractor like Select Mechanical. There isn’t one. We’ve always done a thorough job and maintain very high standards in all of our Preventative Maintenance for all of our customers and will continue to do so. The only difference is, our maintenance will now be performed under the guidelines of the PG&E program standard ACCA 180 (which happen to closely match our maintenance guidelines) and incentives will be paid to you by PG&E. You can opt out at any time with no penalty.